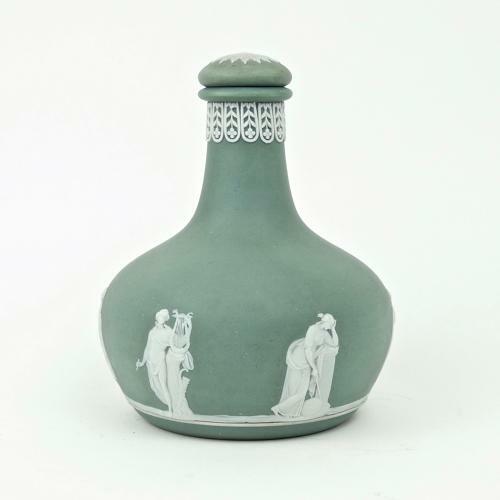 An interesting, Wedgwood, green jasper bottle with stopper. This was made to be sold containing a liqueur. It has the usual, impressed 'WEDGWOOD' mark but there is also a printed mark, within a circle, which reads 'MANUFACTURED FOR HUMPHREY TAYLOR EST. LONDON 1770 DISTILLERS OF FAMOUS LIQUEURS BY WEDGWOOD'. It dates from c.1870 so it could possibly have been made for the centenary of Humphrey Taylors as they were established in 1770. The reliefs figures on the bottle represent Apollo and five of the Muses and the piece is in excellent condition.